Would Maine save money if it embraced Obamacare’s Medicaid expansion? Maine Gov. Paul LePage delivers his State of the State address in in the house chambers in Augusta on Tuesday, Feb. 5, 2013. Republican governors in Florida, New Jersey, Arizona, Ohio and elsewhere who have railed against the Affordable Care Act, the Obama administration’s health care reform law, have softened their opposition recently and endorsed the reform law’s major expansion of Medicaid. But in Maine, Republican Gov. 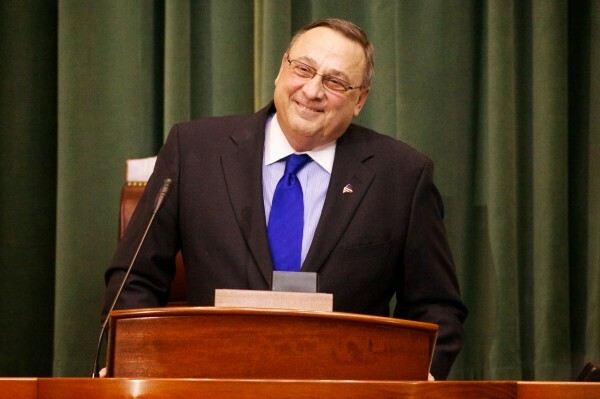 Paul LePage is giving no indication he plans to change his mind and allow Maine’s Medicaid program to grow. The governor’s reluctance comes down to the fact Maine already has a generous Medicaid program that’s often running over budget and doubts that the federal government will stick to its promise of increased Medicaid funds, LePage spokeswoman Adrienne Bennett said. Meanwhile, Democrats have called for the state to participate in the expansion, which takes effect at the start of 2014. Rep. Linda Sanborn, D-Gorham, has submitted legislation that would sign Maine up. “If Maine chooses not to do it, we basically are sending our tax dollars to other states for those folks rather than doing it here,” she said. The Affordable Care Act’s Medicaid expansion — one of the measures in the law aimed at reducing the ranks of the uninsured — spreads Medicaid coverage to groups not traditionally covered under the public health insurance program for the low-income and disabled: able-bodied parents and adults without children who earn up to 133 percent of the federal poverty level ($20,628 for a two-person household). Under the health care law, the federal government will cover 100 percent of costs for newly eligible Medicaid recipients for three years. The 100 percent funding will gradually drop to 90 percent in 2020, and states will have to make up the remaining share. The Kaiser Family Foundation estimates that 21.3 million more people nationwide would receive Medicaid coverage if all states expanded their programs. But the end result is likely to be more complicated. By Kaiser’s count, 27 states so far are planning to participate while 16, including Maine, are not. Eight more are weighing their options. For Maine, the decision is more complicated than in most states, said Jeff Austin, vice president of government affairs and communications for the Maine Hospital Association. That’s because Maine is one of a handful of states that have already extended Medicaid coverage to many of the people who would otherwise be eligible for the first time under the Affordable Care Act. Medicaid enrollment in the state rose 78 percent between 2002 and 2011 to about 361,000 people, according to the Maine Department of Health and Human Services. Maine now ranks fourth for the percentage of its population covered by Medicaid, according to the Kaiser Family Foundation: 27 percent, compared to 20 percent nationwide. Since 2002, Maine has covered childless adults who earn up to 100 percent of the federal poverty level ($15,510 for a two-person household). The state’s Medicaid program has also covered parents who earn up to 200 percent of the poverty level, though that threshold dropped to 133 percent on Friday when Medicaid cuts sought by LePage’s administration and approved by the federal government took effect. About 12,600 parents lost their coverage as a result. In Florida, by comparison, where Republican Gov. Rick Scott recently agreed to a three-year Medicaid expansion, the state’s Medicaid program covers no childless adults and a smaller portion of parents — only those earning up to 58 percent of the federal poverty level. The Maine Department of Health and Human Services is working on a full analysis detailing the financial impact to the state of expanding Medicaid, but it’s not yet complete, DHHS spokesman John Martins said. “Early indicators on the numbers are pretty significant in terms of cost,” he said. But it’s possible Maine would reap rewards for expanding its Medicaid program ahead of most other states. A recent Kaiser Family Foundation analysis projects that Maine would be one of 10 states to see the amount of state funds it spends on Medicaid actually drop over the next decade — by $570 million, or 3.8 percent — while the federal share of Medicaid expenses would rise by $3.1 billion, or 11.4 percent. That would be a sharp contrast to recent years, when falling federal match rates have forced Maine to pay a growing portion of Medicaid costs from its own coffers. Forty states, according to Kaiser, would be spending more state dollars on Medicaid by the end of the decade to expand health insurance coverage. In Michigan, where Republican Gov. Rick Snyder has endorsed a Medicaid expansion, the state would spend $1.7 billion of its own funds by 2022 while the federal government would kick in $17.5 billion more, according to the Kaiser analysis. Ohio, where Republican Gov. John Kasich also has endorsed an expansion, would spend $4 billion in additional state funds and receive $53.3 billion more in federal funds. In Maine, fewer residents would qualify for 100 percent federal funding. But the federal government is promising to increase its share of costs for states like Maine that have already expanded Medicaid. That means the state would receive more federal funds to provide Medicaid coverage for some people it’s already covering. The increased federal share would rise to 93 percent of costs in 2019 before settling at 90 percent in 2020, according to the federal Centers for Medicare and Medicaid Services, or CMS. The federal government currently covers 62.57 percent of Maine’s Medicaid costs, a rate that has dropped from a high of 74.86 percent in 2010. “States will receive the highest matching rate possible for a given population; being an expansion state will never disadvantage the state in terms of matching rates for that population,” reads an explanatory document issued by CMS in December. But there’s reason to doubt such a federal guarantee, said Stefanie Nadeau, the state’s MaineCare services director. The state has already seen federal Medicaid rates rise — as a result of the 2009 economic stimulus package — then fall. The Kaiser analysis projects Maine’s Medicaid rolls will grow by 55,000 people over the next decade if the state expands the insurance program. Even if Maine doesn’t expand, the analysis predicts 10,000 more people who may currently be eligible but unenrolled will join the rolls. Part of that could be the result of the Affordable Care Act’s individual mandate, which requires everyone obtain insurance coverage. Health and Human Services Commissioner Mary Mayhew recently discussed that uncertainty with a committee of Florida lawmakers weighing whether to sign their state up for a Medicaid expansion. While Maine’s Medicaid program has grown since 2002, she said, the number of uninsured residents has barely budged while the amount of uncompensated care the state’s hospitals provide has grown. In 2008, Maine’s hospitals provided $286 million in care for which they weren’t compensated, a combination of charity care and debts they couldn’t collect, according to the Maine Hospital Association. That number grew to $421 million in 2011. Maine hospitals are required to provide free care to those without insurance who earn up to 150 percent of the federal poverty level. When Maine expanded Medicaid in 2002, some hospitals chose to provide free care for uninsured people earning up to 200 percent of the poverty level, said Austin of the Maine Hospital Association. The Maine Hospital Association hasn’t taken a position yet on the Medicaid expansion in Maine, Austin said. The group needs to see more of the financial details, he said, and needs guarantees that the state won’t continue cutting hospital reimbursement rates to fill budget holes. The Kaiser Family Foundation analysis projects Maine’s hospitals would see $348 million more in payments from Medicaid over the next decade if the state expands the program. They would also have to provide less care for which they aren’t paid, according to the analysis. “We have a lot of factors pushing us toward support, but budget realities are going to get in the way of that,” Austin said. Matthew Stone is a reporter in the BDN’s State House bureau.